Slow Sam: Why is it so hard? This is my story. 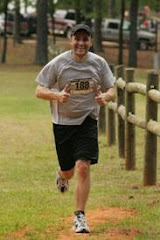 I'm training for my next race and beyond and would like to go from the back of the pack to somewhat middle of the pack. Why is it so easy to skip the workouts that I need? The feeling I get after a workout is great but I just can't get going. I'm just an average middle age guy that is trying to get his life back. One day I looked up and didn't recognize myself; I was fat, bald, and attached to the couch. I have a wife, son, and dog who I love and they love me. I will turn my life around starting with my health. I need you all to log on and VOTE!